Joseph Ratzinger has been the first Pope to resign in 600 years, and he is also involved in another primacy: Benedict XVI will be remembered as the first Pope in history to join a Twitter account. He posted his first tweet on the 12th of December 2012, two months before proclaiming his resignation. On February 28th, the last day of his papacy, his Twitter account spread the news with the words “sede vacante”, “vacant post”. 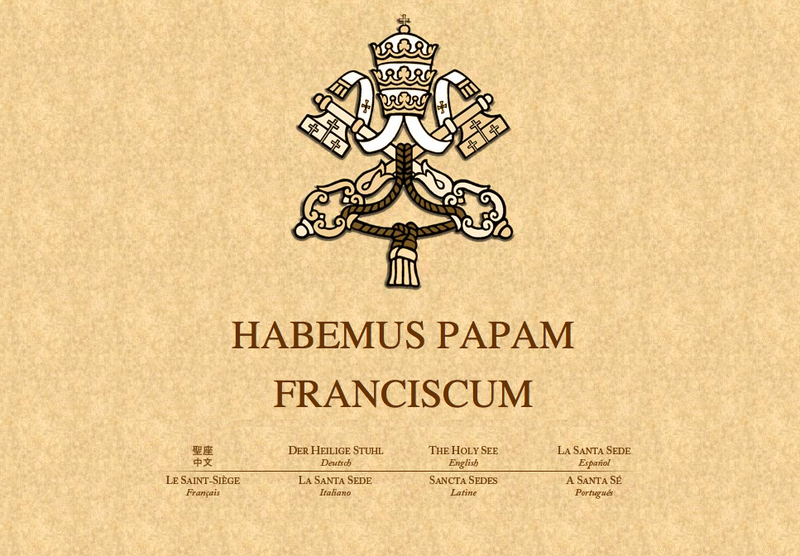 Similarly, the new Pope Jorge Mario Bergoglio has been welcomed by the words in Latin “HABEMUS PAPAM FRANCISCUM” on the Twitter account. A Twitter account for the Pope certainly marks a new tendency of the Vatican to open to new technologies, after being active on the web with its official website . However, the Pope’s Twitter account showed a certain clumsiness and naiveté in dealing with social networks, and to engage with people in this particular space. Twitter, as Facebook and other social networks, has peculiar rules and modes of interactions that are different from institutional websites. For this reason, tweets to the Pope have not always been respectful and welcoming, showing that probably Twitter users probably have a different conception of cyberspace from the one the Vatican has. 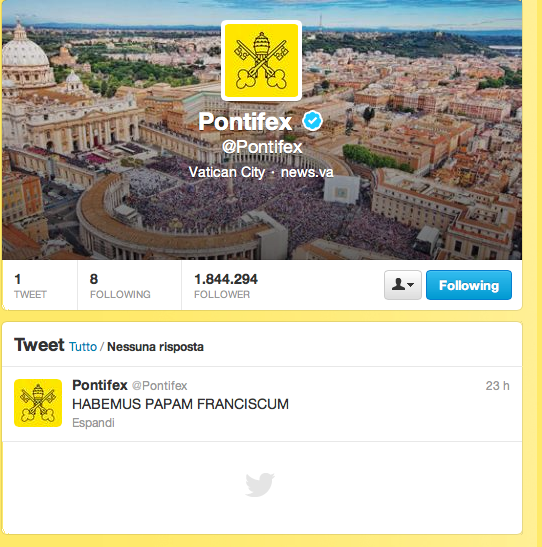 Also, the short presence of Pope Benedict XVI on Twitter had some idiosyncrasies. For example, as explained in Elizabeth Drescher’s article on Religious Dispatches, the Pope did not follow anyone; instead, he was only followed. He shared this characteristic with another spiritual leader with a longer Twitter history, the Dalai Lama. Furthermore, the account is not personal: as Joseph Ratzinger resigned, he disappeared from Twitter as well. Francis I has inherited not only the garments and the position on the balcony on St Peter’s Square, but also an emptied Twitter account. This is something unusual for social media, where people usually engage as individuals and have personal accounts. Since the first tweet of Benedict XVI, Twitter users showed three different types of reactions to his presence. Some responses to the Pope expressed support, admiration, and love for him and the Church. These are probably the reactions that the Vatican expected, and one of the main reasons behind the decision to open a Twitter account. However, other tweets contained harsh critiques of the Pope and his operate. For example, many people underlined the intolerance of the Church towards gay people, or the scandal of pedophilia among priests. These Twitter users somehow underlined the discrepancies of an institution that tries to modernize using social media but fails to engage with problems of today’s society. Also, many people used the hashtag #askthepope, and its Italian version #faiunadomandaalpapa to make jokes about him and the Church in general. According to the website www.faiunadomandaalpapa.com, in two months 44719 tweets ironized in Italian on Pope Benedict XVI and the Church; also, the best tweets have been collected in an Italian book called “@pontifex. faiunadomandaalpapa. I tweet più folli sull’account di sua santità” (“askthepope. The weirdest tweets on his holiness’ account”). From jokes about an apparent love between Joseph Ratzinger and the popstar Madonna, to the fact that the name “Pontifex” reminds of a brand of condoms, to questions about how to turn water into wine and use it for parties, many Twitter users seemed unable to refrain from making fun of the Pope. These different reactions showed a new engagement with the Papacy and marked Twitter as a new space of action for members (and non-members) of the Catholic Church. The traditional place of the Church is St. Peter’s Square in the Vatican, where the Pope maintains an unchanged proxemics position on his balcony. The relationship between the Pope and his followers is clear: he is a spiritual guide that speaks from above, and people listen to him from below. This use of space was evident during the elections of the new Pope, where thousands of people from all around the globe gathered in the square waving flags, jumping and crying for the first speech of Francis I. The website of the Vatican mirrors this physical space and provide a transposition of it on the web. Translated in various languages, the site does not have space for interaction with people but gives information to believers and present pictures and news about His Holiness. The way this site has been constructed is very similar to the way his followers look at the Pope from St Peter’s Square or on TV, from a down-top position. Apparently, Ratzinger and his equipe seemed to perceive Twitter as the Vatican’s website, a space to follow the Pope, where he does not actively participate by following anyone. However, Twitter provides a totally different space of action and engagement. On Twitter, although the Pope is the leader of the Catholic Church, his account has the same value of any other person’s account. People cannot criticize or make fun of the Pope from St Peter’s Square, where there is no possibility of interaction but only of listening and worshipping. On Twitter, however, the Pope does not appear on a balcony, and anything can be said. The freedom of Internet and the protection of nicknames allowed people to write in 140 word messages whatever they think of Benedict XVI. Joseph Ratzinger was not only the first Pope on Twitter, but also the first one to receive tweets that addressed him like “Benny” or “The German Shepherd” and ironized about the fact that he wears “Prada shoes like the Devil.” Before the Pope’s Twitter account, there was no space or possibility to engage directly with him in this free, ironic, satiric and disrespectful way. Twitter made it possible to create a new ‘Third Space’ where people’s attitudes towards the Pope are completely different from the traditional engagement we see in physical spaces. Francis I will not only have to face scandals of the Church and an increasing secularization of the society; he also has the legacy of a Twitter account where people do not fear to call him “Franz”, and criticize him for his role during the Argentinian dictatorship. Twitter is a complex space of resistance, and it can generate spontaneous movements of people supporting or resisting something. 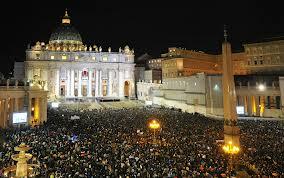 It cannot be controlled like the physical space of St Peter’s Square, where believers go to show their faith. Twitter is open to anyone, Catholics, Atheists and people who dislike the power and the decisions of the Church. All of these users are free to tweet their thoughts, even if they are against the Pope. Apparently, Bergoglio already has a Facebook account and he is in favor of new technologies, according to an article of the New York Times . It will be interesting to see how Francis I will manage his respectful and disrespectful followers, and if he will be able to engage with Twitter in a meaningful way, understanding that it is a very different space from St. Peter’s Square. ← Salafism on YouTube: Rebranding, reforming, or reviving Islam?